Amazing opportunity not to be missed! Nestled on a private drive with an impressive 18,699 sq.ft. park-like lot, beautiful mature trees and lush landscape, this home truly embodies privacy and serenity. Boasting a fantastic floor plan this gracious traditional home features 4 spacious bedrooms (3 upstairs and 1 down) with 3.5 well appointed bathrooms. The expansive master suite will not disappoint with a soaring cathedral ceiling, tons of natural light, a fire place, siting area and grand master bath. This home offers a large gourmet eat in kitchen, a formal dining room that opens up to the pool area, formal living room, a vast open family room, a detached pool house/office space, security system and so much more. Award winning La Canada Schools! Incredible investment opportunity! Well kept, beautiful 6 unit apartment building in a prime, very high demand rental area of Glendale. Attractive unit make up of 6 spacious 2 bedroom 1 bath units. Each apartment has been extensively remodeled with upgraded kitchens, bathroom fixtures, laminate flooring and newer windows. Additionally, this property offers 6 off street parking spaces and a shared coin operated laundry room which generates additional income. This is a turn key building in a high density rental income area close to shopping, restaurants, schools and transportation. Exceptional property with TREMENDOUS upside. NO RENT CONTROL. Please note that financials are based on pro forma/market figures. 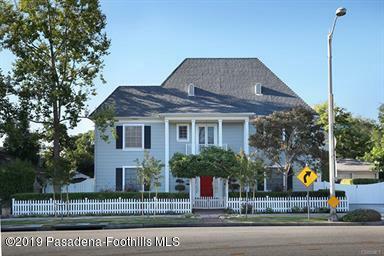 Gorgeous, completely remodeled one story nestled in the heart of Upper La Crescenta. New hardwood floors, crown moldings with extensive high quality details are enjoyed throughout. Features include 4 spacious bedrooms and 2.5 well appointed bathrooms including an elegant master suite with luxurious master bath plus formal living/dining area. Boasting a fantastic open floor plan, this home was designed with a seamless flow for gracious indoor outdoor entertaining. The designer gourmet kitchen features a lovely center island/breakfast bar and opens up to the generous sized family room. Serene views from master suite. Absolutely stunning home! Award wining schools. Two homes on one lot with fantastic potential for an owner occupied for one house and potentially rent out the other. The front house is a two story 2 bedroom 1.5 bath and has been extensively updated with newer flooring,lighting, updated bathrooms, chefs kitchen with granite counters and stainless steel appliances. Both of the EXTRA LARGE bedrooms upstairs feature suite like sitting areas which could be office spaces and both have spectacular city light and sunset views. Charming back house is perfect for an extended family and or in-laws. Property is gated and and there is plenty of off street parking. Close to shopping, restaurants, transportation and schools. Back house is not a legal rental unit. Back house is zoned as a Rec Room. Beautifully renovated modern mid-century retreat with stunning views. Architecturally significant home by mid-century modern architect Charles Wong. Featuring a fantastic open floor plan with floor- to-ceiling walls of glass throughout the home. Large patio with direct access from three sides of the house makes this home truly an entertainers delight. West wing features 4 well-appointed bedrooms including a gracious master suite. The gourmet kitchen with an expansive center island opens up to a stunning great room with soaring ceilings, exposed beams, a romantic fire place with serene views. Additionally, there is a large family room off the kitchen that connects to a hobby room with enough space for an exercise area. Other amenities to be enjoyed are a built- in outdoor grill, lush landscape and zoned central AC. Truly a special home not to be missed. Blue Ribbon Schools.